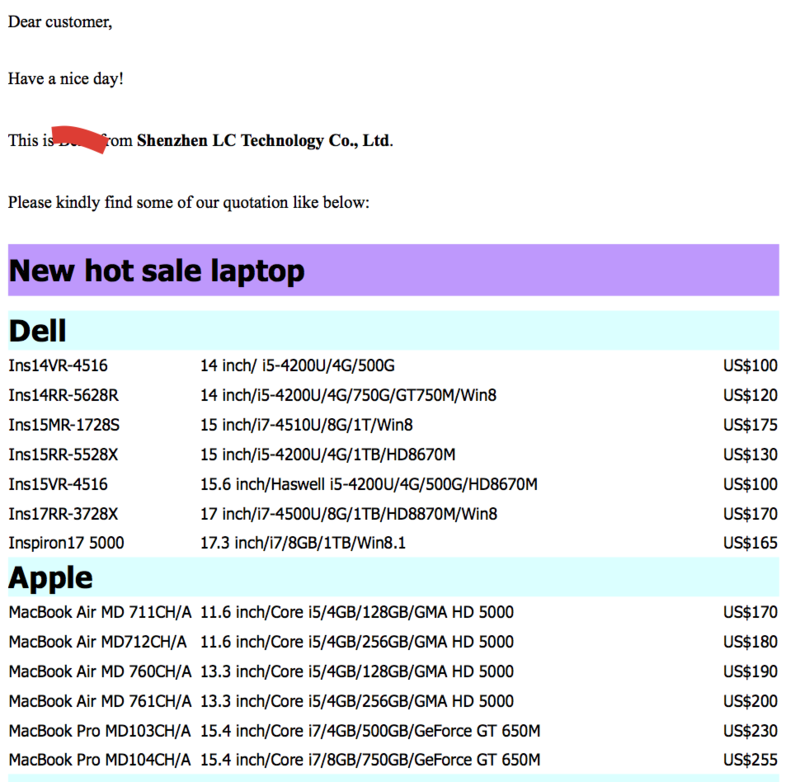 After requesting some quotes on computers in China-based global trade site Ali Baba, a friend of mine was bombarded with offers via email. You can see an example in the image bellow. Can a Macbook Pro cost US$ 230? If so, how can these companies sell at such a low price? Is this economically possible to sell those products at that price? EDIT: The email came from a szlc-electonic.com domain. That page is down, and it doesn't match the seemingly legit lctech-inc.com nor hktdc.com, both reported by Google as being Shenzhen Technology. It seems to indicate that the email originators are trying to impersonate Shenzhen LC Technology which doesn't sell laptops. This article claims that in 2010, the "Bill Of Material" for the cheapest MacBook Air was $718. 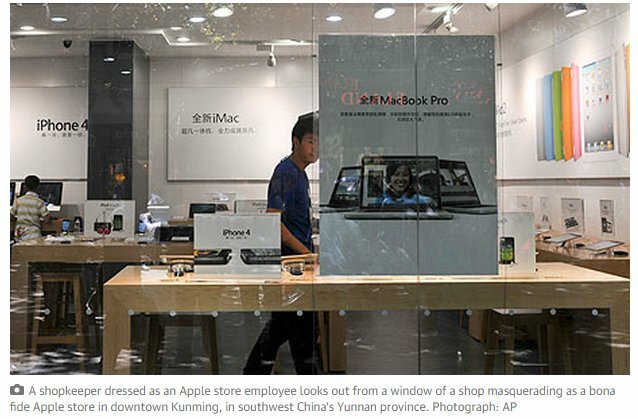 So if, for example, Foxconn decided to buy some extra parts and do an extra shift to produce some MacBook Airs on their own and sold them at cost, they would cost $718. 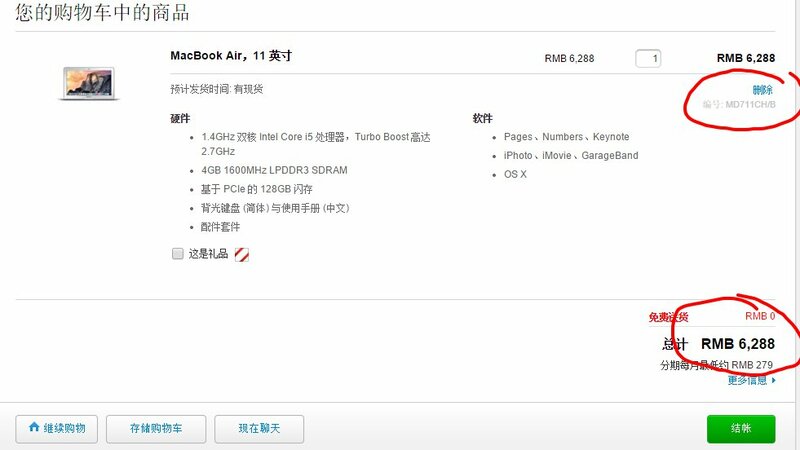 The Bill Of Materials has probably gone down since then, but even so there is no way that a halfway legitimate business could sell a MacBook Air for $255. Also, there is a large "fakes" industry in China. They even have tons of fake Apple stores! Not the answer you're looking for? Browse other questions tagged computers china . Did a malware using only sound transmissions between speakers and microphones to cause infection exist?